Can eternal terrariums help grow food in outer space? Can eternal terrariums help grow food in outer space? Well, let’s first establish what an eternal terrarium is. 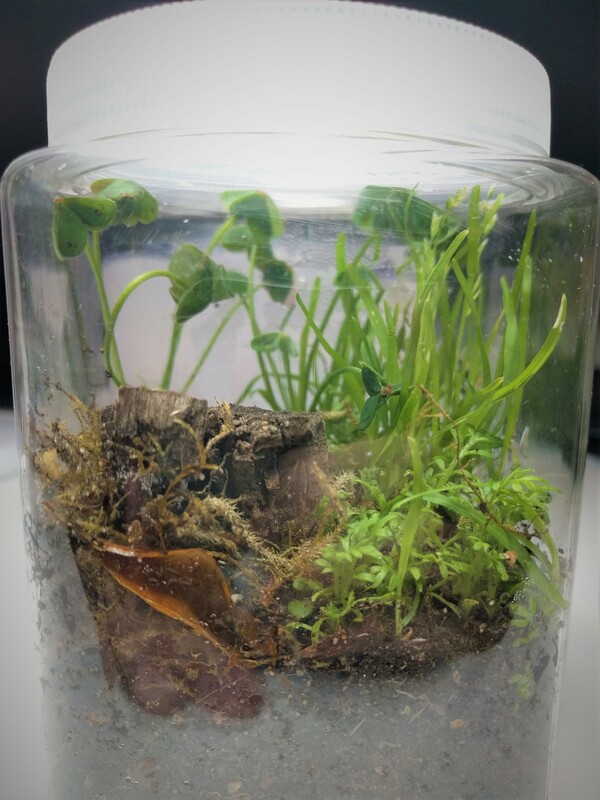 An eternal terrarium is a mini-terrarium for plants and small animals that is also a closed environment. It is usually made with a jar because jars are air-tight. No oxygen and no carbon dioxide can get in through the air-tight seal. So how does a plant survive? A plant needs three key things to survive and a few extra things to give it a health boost. The big three are carbon dioxide, water, and sunlight. These eternal jars are made of mason jars or any type of air-tight jars that are transparent; that takes care of sunlight. For water, you simply spray the plant a few times before you close it and keep it closed for eternity. That’s right, the water in the jar is naturally recycled! When you spray it a few times in the beginning, the moisture will go into the soil in the jar and give the plants water. When the water starts pooling and it has nowhere to go since the jar is closed, it will condense on the sides of the jar. When these little droplets of water build up on the glass, it will slide back down the glass and water the plants. It will imitate rain in this mini-environment. This cycle will repeat and the plants will be continuously watered with no help. This will take care of water for the plants. Carbon dioxide also has a simple solution. When you put soil in the jar for the plants, you want to get the natural soil and not the ones from the store. This is because natural soil or soil from your garden will most likely have micro-bacteria and small insects. These miniature creatures will take in the oxygen (plants don’t like) and produce carbon dioxide which is necessary for the plants’ survival. So the small animals and the plants are helping each other to survive. The plants will also get a nice boost from fertilizer. In order to not disrupt the animals and micro-bacteria, do not use store-bought fertilizer. The jar will fertilize itself! Dead plants and animals will decay and nourish the soil for current and future plants. So this is how plants can survive in a simple closed environment like a air-tight jar. Then back to the main question. Can these plants in jars survive in outer space? Theoretically, yes. The good news is, because the plants can survive in a closed environment on Earth, it should have no problem in space. The bad news is, the plants will need some help due to circumstances in space. On Earth, the sun is in the sky for a long time, so the plants will easily get sunlight. However, in space, the plants will most likely be in a jar which will be in a spaceship. The spaceship will probably be rotating and only face the sun sometimes. In fact, there may not even be any windows depending on the spacecraft! In order to simulate a plant’s life on Earth and to fix this problem, the spaceship would need UV lighting to imitate the sun’s energy. It would also need an automatic timer to turn the light on and off at 12 hour intervals. The light can not be on the whole time because there is night-time on earth which is crucial for many plants’ survival. The next problem is the temperature. Space is very cold, so plants can’t survive. But this is easily fixed with some heating on the spaceship. The final problem is getting the food out from the jar. The astronauts would have to open the jars in order to get the food out. Well, this also has a simple solution. Just open it in a compartment of the spaceship where humans can survive with no oxygen helmets. Now people may be asking what type of food in the world would you be growing in a jar? Well, it doesn’t have to be a jar. The astronauts can scale this idea up into a bigger version. Instead of jars, they can use giant sealed containers and have rows of vegetables and other edible plants. If we can really get this to work, it will be the biggest scientific break-through ever. Plants would be grown in large amounts in space! We wouldn’t need to worry about over-population and other harmful things that are happening right here on Earth. But in order to think about moving out of earth and exploring the vast universe in the long term, we need to fix our food problem. And these simple eternal terrariums may just be the answer.